Ask people working in an office or living in a multi-story house, and they might tell that strong Wi-Fi coverage is only a dream for them. Regardless of the Wi-Fi devices, they connect to their router, signal strength always remains weak. As for the speed, the absence of signals means they cannot even think about this factor. The routers mentioned below would have no such shenanigans. 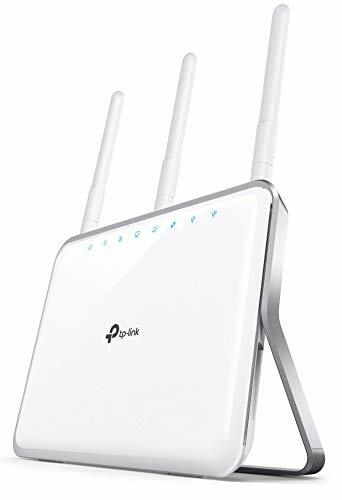 Offering dual-band connectivity, the freedom to create a guest network, and a bandwidth meter – which allows you to increase or decrease the bandwidth limit, the AC1900 from TP-Link is one of the most popular routers on Amazon despite the fact that it doesn’t come cheap. What are the reasons for its fame? Let’s find out. Starting from its design, and ‘classy’ was the first word which came to my mind on seeing this router. Silver accents complement the glossy finish on top of this router, and with its size of a hardback book, what AC1900 does offer is a sturdy-yet-classy model. On towards more tangible features, and dual-band connectivity is the first to attract our attention. Still, you’d have to set the model for dual-band connectivity it comes with a pre-determined frequency of 2.4GHz for British and 5GHz frequency for American users. It means you’d have to reset the frequencies to get the optimal performance. While changing the frequencies, you might come across the Guest Network feature inside this router’s app. As if one wasn’t enough, this setting lets you operate two – yes, TWO – guest networks at one time, with one guest network per band. That is, if your office has a driver’s area and a VIP Lounge, you could set separate guest networks for both. Moving on, and just under the guest network setting appears the bandwidth control option. If you don’t have unlimited data at your disposal, you could use this option to increase or reduce the bandwidth limit of your router. Wireless range of this device, thanks to the beamforming technology on offer, didn’t disappoint either. Thanks to this technology, a beam would be created between the router and the connected device, which would maintain a steady and extensive flow of signals between the router and the device at all times. Making sure you could take full advantage of all the abovementioned features is the Tether app from TP-Link. Available on both Apple Store and Google Play, Tether lets you see the devices connected to the network, allows you to create a guest network, and lets you block any unwanted devices. And if you are using any other TP-Link device, all of them could be managed with this one app. Despite the AC1900’s above-average price tag, the fact that it doesn’t offer MU-MIMO might be a deal breaker for some. That, and the fact that you’d have to reset the router to dual-frequency – as it comes preset on one frequency – doesn’t seem to justify its price tag. With an extended wireless range, impeccable Wi-Fi speed and two guest networks, the TP-Link AC1900 has something to offer whether you play online games or stream 4K HD Videos. Offering a mixture of super-fast 5 GHz speed and a user-intuitive Netgear Genie software, the Netgear Nighthawk is a must-have for any gamer out there. Still, like all other products in the market, it is not without its shortcomings. 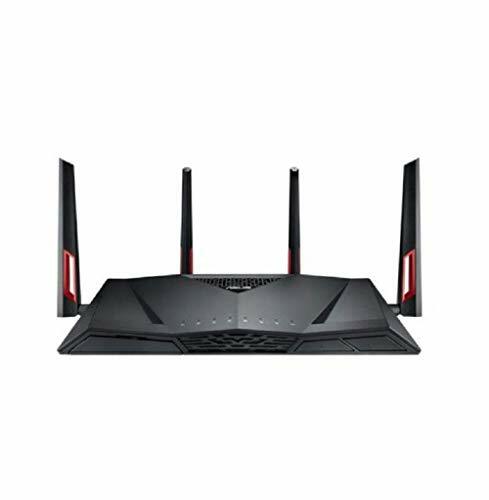 Look at its size, and at 11.2*7.3*2.0’’, you might doubt about the efficacy of this router. Still, one glance at the antennas – there are three of them in this model – and how they perform, and all your doubts would evaporate into thin air. For instance, justifying the price tag of this model, the three-antennas are ‘high gain’, which means they would ooze signals. Still, if you think they are not covering your entire house, you could replace them as Netgear has made them detachable. In this way, you could install 3rd party antennas to get maximum signal strength. Turning our attention to its performance, and Netgear has made sure that you could use this router for long by providing it with an open source firmware. This feature would help to make this router long lasting. For, unlike old Apple phones which stop having updates once a new model arrives, you would always be able to update this router and its firmware, so that both its performance as well as security aren’t compromised. That is, once its updates stop coming, it won’t become useless like its counterparts from other brands. Instead, all you’d have to do is to update its firmware from the market and keep using the router for as long as you want. Quality of Service is another feature of this model which adds to its performance. Apart from supporting dual-band connectivity, the QoS feature allows you to prioritize one site – or one device – over the other. In this way, you’d decide which client on your network deserves more data at any time. Finally, to assure you that it would provide enough signals for large homes, the AC1900 comes with beamforming. As stated above, this technology finds your device – and not the other way around – so as to provide consistent signal strength all the time. Compare it to what is standard in the market, and the 1-year warranty provided by this model isn’t enough by any means. While its reduced warranty has left a bad taste in the mouth, this router has enough features to make up for it. Therefore, if all you want is a high-speed online experience, this router might be enough. Have doubts? Let’s look at its features to quash them. Starting with the Wi-Fi speed this router has to offer, and it would break any speedometer with its QAM Technology. While ordinary routers receive better speed at only one band – 5 GHz, to be precise – this router offers impeccable speeds at both of them. Yes, regardless of whether you have switched to the long-range 2.4GHz band or its speedy 5 GHz counterpart – or whether your device supports 802.11ac or not, you’d get up to 60% more speed on both bands with this router. Moving ahead, if your room is on the third story with the router on the ground floor, you won’t have to come all the way down. Why? Because it has four, foldable antennas which you can turn 180degrees to eliminate Wi-Fi dead zones from your home. However, if you live in an office where it is the speed and NOT the range that you need, the eight Gigabit Ethernet ports on this router might help. By diverting the load to wired devices, these ports reduce their impact on the Wi-Fi, hence providing breathtaking Wi-Fi speeds at both. Next up is the MU-MIMO technology which won’t need your assistance to get going. Instead, thanks to its 4*4 capability, the technology would switch between four connected devices on its own. In this way, you won’t have to tinker with the Quality of Service feature of this model as the MU-MIMO would prioritize devices based on the data they are consuming. Beyond its speed and coverage range, the RT-AC88U excels with its easy setup, brilliant network monitoring features, and a cinch-to-use Web interface. It includes a TrendMicro vulnerability detection feature which would make sure you browse the internet safely by taking care of malware on its own. Finally, if you’re looking for a gaming router, this router has a built-in game acceleration feature which automatically increases the data transmission to any online-gaming device. Consequently, you won’t have to suffer any mid-game pings. While the USB 3.0 port is above-average in performance, its awkward placement on the front side lets down the router. USB Port’s positioning is awkward. A mere glance at its price tag would make it clear that this router demands above-average price for its services. However, now that you have read its features, you might tell that it offers everything that anybody could want in a router. So, if you can afford it, buy it. As is evident from its appearance – with a glossy white orb welcoming you – the Portal Wi-Fi router is different from any other router you may have. Thankfully, it is not only its design but also its performance which makes it different – and better. 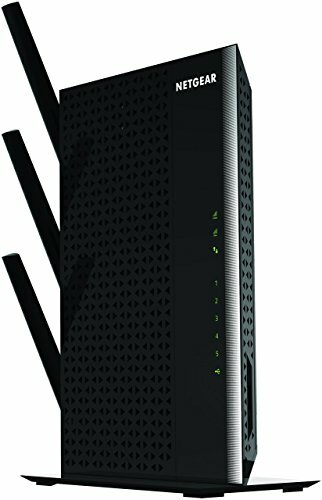 Portal Mesh Wi-Fi Router – Reliable, high-performance wireless ready for gaming. Unique DFS Spectrum usage to eliminate congestion. Advanced Mesh Wi-Fi covers whole home. Some routers are easy to setup, bug lag on performance; others require hours to get going, but provide high-speed flow. With the Portal Wi-Fi router, you get a device which bridges the gap – as, in addition to being easy to setup, it could provide lightning fast speeds. How? Well, say hello to its ‘Fastlane’ feature. In simple words, this feature increases the speed of the router by figuring out on itself which is the best channel to use. And by the best channel, it means that channel which has less interference and more speed. What’s more, the feature is monitored by a 650-MHz compressor to ensure maximum speed at all times. Behind the scenes – and to further complement the Fastlane feature and increase this router’s speed – the MU-MIMO technology comes into play. The technology shares the capacity of the router among multiple clients so that none of them gets left behind. Still, if you feel you’re the one deserving of the most data, the beamforming feature would fulfill your wish. Worried about the lack of antennas? You don’t have to as there are nine of them, albeit internally, just to give this router a sleeker look. Still, them being internal won’t stop these antennas from generating signals. Also, in contrast to most routers out there, the Portal Wi-Fi router doesn’t have rows and rows of LEDs. Instead, all it has is an ‘O’ on the top. When it turns red, something is wrong, blue means it has just connected to the internet, whereas green means the router is running at peak performance. Lastly, setting up this router would be one of the easiest tasks of the day. All you’d have to do is to turn the Portal on by plugging it in, before connecting it to your modem. Next, download its app on your phone, turn on the Bluetooth, and the Portal would discover it and ask your permission for pairing. Once you do that, it would require you to enter its name and password, after which you’d be good to go. Two flaws were highlighted in this model by its users. First, they say that it could have done better than opting for low-speed USB 2.0ports. Second, it doesn’t have a Wi-Fi Protected Setup button. 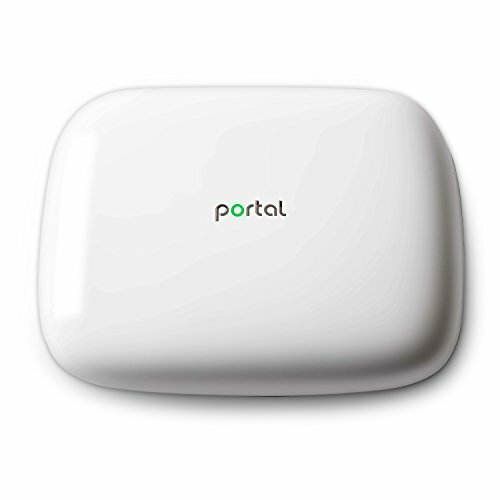 Portal Wi-Fi router is one of those rare devices which not only offers good performance but is a cinch to set up and provides both long range and high Wi-Fi speeds with minimum interference. What more can you ask from a Wi-Fi router! The Google Wi-Fi router is a mesh router system which means that instead of blasting out fast Wi-Fi signals, its priority is to blanket the space around it with uniformly high-performing Wi-Fi by generating it from multiple locations. Found the description confusing? Scroll down for help. Since it is a mesh system, people often think that its different units would consume more space. However, as suggested by its 12oz weight – and a height of 69mm, this unit is minimalist in design, which means it offers a discreet Wi-Fi solution for your home. The reason for its small size lies in Google not copying other routers – as it is the technology and NOT the size where this Wi-Fi impresses. For, be it MU-MIMO (which spreads data to multiple clients at one time), or beamforming (which ensures the uniform consistency of signals at all times), this router comes loaded with features. One thing which you might want to note about Google WiFi is that it won’t replace your modem. Instead, it will connect to the existing one through one of its two Gigabit Ethernet ports, hence leaving just one for your usage. While the hardware attracts you by its minimalistic size, the software of this router is where it showcases its class. Setting up the router is super-easy, after which the Google Wi-Fi app would manage every of the router’s function. From 24*7 monitoring of your network to the devices connected to it and all its points, the app also has a built-in speed test which is similar to Ookla. What’s more, it allows you to prioritize bandwidth, enable parental controls and control any other smart home devices you may have. Turning our attention to its performance, and the traffic prioritization feature deserves a mention in this regard. For instance, if there are two devices in your home – the first of which is Facebooking whereas the other is having an online gaming session, the traffic prioritization feature would direct more of the data towards the latter for a smooth, uninterrupted experience. Plus, if any of the Wi-Fi points lose power or are accidentally unplugged, the network would automatically repair itself without requiring your intervention. Want to control this device? You need to have your smartphone at all times since its hardware control is, at best, limited. It costs less than other mesh routers in the market, but still manages to make all of them look out of date. Hence, if you are looking for a simple yet reliable way to inundate your house with W-Fi signals, the Google WiFi router deserves your attention. Many people think that Wi-Fi routers and access points are outdated and that Wi-Fi mesh is what the future is all about. If you believe in them – and look at mesh systems like Orbi – you’d think that the future isn’t too bad. 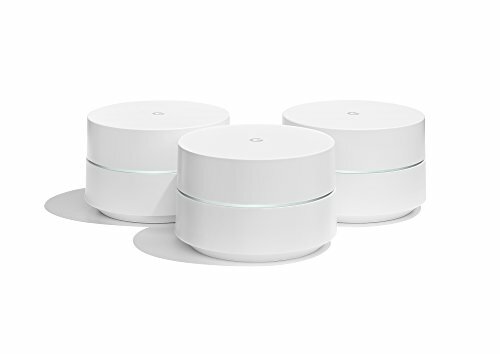 First thing first, in stark contrast to what is advertised, the Netgear Orbi is not a one but a two-unit product: the Orbi Satellite and the Orbi Router. Weighing 889g each, both devices are anything but small, which means you’d need to make some space for them. Once you have set up the device – the details of which we won’t bore you with – a solid blue ring would go on to indicate a stable, strong connection. If you aren’t lucky, an amber or magenta ring might appear, which means you need to close the gap between the router and the satellite. To take the pain out of its setup, the Orbi only has one SSID; which means you won’t have to remember different passwords for different bands. Also, depending on your location, the single SSID will automatically connect you to the nearest band, which means you would get strong Wi-Fi signals without doing anything. How does it work? Well, the router and the satellite combine to broadcast three separate Wi-Fi signal bands: the first two at 2.4GHz and 5GHz respectively, and the last one at 5GHz. While the first two would supply data to you, the last one would communicate between the satellite and the router, which means it would function as a wireless backhaul. Thanks to this wireless backhaul, Netgear Orbi has eliminated the problem which people experience with most extenders. For, extenders rely on the same band to communicate with your device as well as the modem, which inevitably results in the loss of speed. The Netgear Orbi employs two bands for the same purpose, hence saying goodbye to any speed problems. Another area where Orbi sets itself apart – especially from other mesh systems – is the customization it offers. Just like a normal router, it allows you to log into a browser and adjust any setting you’d expect; be it Wi-Fi access points or parental controls and from VPN activation to blocking websites. Also, advanced features such as MU-MIMO and beamforming are also available here. Lastly, when measured at a distance of 150feet from the Orbi, we were able to get 229.1MBps of speed, at least seven times more than what Google Wi-Fi offered us. Therefore, with such results, Orbi’s claim that it could cover 2,000square feet is most probably an understatement. Three complaints, though none of them affect the performance of the Orbi. First, it is extremely expensive; second, its size is way too big, and finally, Orbi mobile app has limited functionality for now. 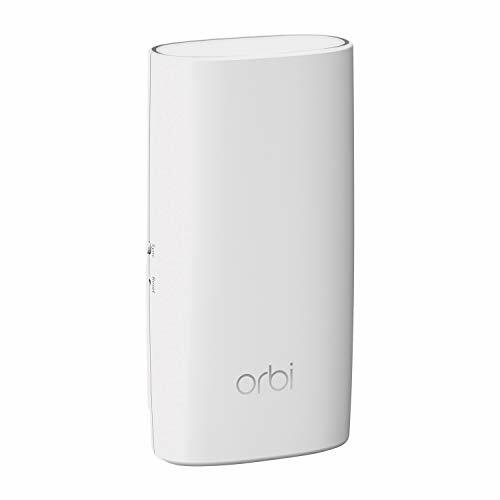 Though astronomically priced, the Netgear Orbi is one of the most powerful and fastest mesh routers you’d ever see. Hence, if long-range coverage and fast Wi-Fi speed are what you desire, Netgear Orbi might be your best bet. Joining the likes of Netgear Orbi and Google Wi-Fi system, the Amplifi HD employs mesh networking in its aim to beat a standard router with its wireless coverage. Will it be able to justify its lofty price tag? Let’s find out. The first thing which comes to your mind while seeing this router is that its shape resembles more of an alarm clock than that of a router. That, in itself, is a good thing as its nice-looking exterior means it might become your home’s fashion statement. The AmpliFi HD has a color screen showing day, date and time at all times. Tap it, and it would tell how much data you’ve consumed over the past day. Tap it again, and the router’s IP address, its WAN and the number of devices connected to it, would be shown. Tap it more than once, and a speedometer would show up. That said, if you don’t like tapping, there’s an app which would do all that and much more. Apart from showcasing all that we already mentioned, the app allows you to set bandwidth limits, blacklist devices, create guest networks and pause all networks. Still, the fact that the app lacks Parental Controls and QoS leave something to be desired. Fortunately, installing the router is a breeze. Once you connect the router to your modem and the device, just tap (again) the Set UP Amplifi Button, enter the name and password, and the network would be up and running. Looking at its coverage, and the AmpliFi HD heightens your expectations even before you buy it by advertising that it has a coverage area of 20,000square feet. Thankfully, as we found out during our review, the claim wasn’t way off the mark. Even if you don’t install its mesh extenders, it offers a range of 90 feet even with obstructions. Install them, and the range goes all the way up to 3,500square feet. Concluding its review, its good performance, simple and quick setup and excellent range makes the AmpliFI HD in a category which is becoming increasingly competitive by each passing day. If you want to connect hard drives or printers to the router, its USB 2.0 port – which, according to the manufacturer, is for future usage (whatever that means) – won’t be of much help. 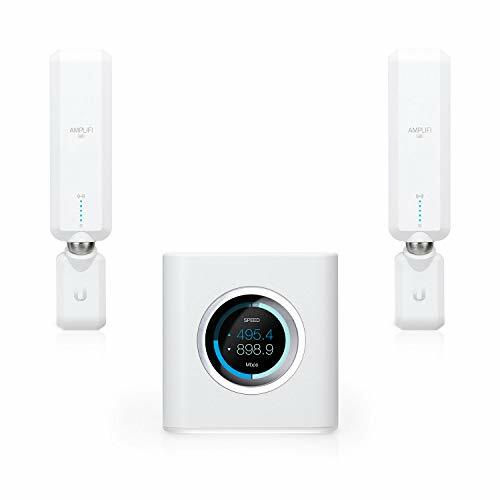 Its expensive price tag may take the AmpliFi HD Home WiFi System out of the reach of the majority, but for those who can afford it, it is one of the most reliable ways to flood your home with Wi-Fi signals. Taking full advantage of the tri-band concept, the Nighthawk X6 claims to provide long range and brilliant Wi-Fi speeds to multiple devices on the same network. Will it suit you? Let’s find out. For those of you who think three or four antennas boost 802.11ac Wi-Fi’s networking performance, this router has six. Rather than being shabby, the antennas are foldable, extend up to 3.3’’ and you can adjust them to 140* angle. And as we found out in our review, they provided an excellent range to the hilt. Sadly, though, they aren’t detachable. What’s more, all the antennas rely on state-of-the-art beamforming technology to sculpt signals in such a manner as to suit the receptor antenna. Put simply, this technology makes the signals track and trace the connected devices, hence ensuring consistent signal supply. Talk about customization, and the X6 allows you to configure it manually. You can set the router up as a router point, and if you feel that its security isn’t up to it, update its firmware on your own. One thing which we liked the most about this router was that it allowed you to set different top-speeds for the bands. It means that if two users are using the internet – and one of them needs more speed for their task – you could use the ‘Top Speed’ function to provide them with the same. As for sharing, we were able to connect this router with a plethora of devices – be it desktop, printers, tablets or internet radios – in one go. But for that, you would either have to enter the router’s password manually or use its WPS protocol. Apart from getting the router up and rolling, the Netgear Genie – the mobile app which accompanies the router – can let you perform a variety of functions. It has a Traffic meter showing upload and download speeds. And if you feel that your network’s speed is going down, the app lets you choose your Wi-Fi Channel to differentiate it from your neighbor’s. For security purposes, the Genie app, after asking you, would send an email every time a new connection logs on. It also has a Guest Network feature which allows the outsiders to browse the web while blocking their access to your network’s drives. Lastly, if you want to prevent older devices from decreasing the Wi-Fi speeds of newer ones, the X6 has a Smart Connect feature to do that. Still, both the 5GHz channels need to have the same name for the Smart Connect feature to come into play. The 2.4GHz band is a bit buggy, which means that more often than not, you’d have no choice but to rely on the 5GHz band for good performance. Not all the devices in today’s market would support the relatively new 5GHz band. If yours do – and you can afford to pay over the odds for a high-quality router – the X6 AC3200 won’t disappoint. Released in 2015, it might not be the most stylish Wi-Fi router in the market – it is ugly, in fact, but what it lacks in looks this router more than makes up for in its performance. Compare it with the WRT1900ACS – its predecessor which was released in 2014, and you might note that Linksys have decided to forego the inline power supply for a wall-mount, which means that it could both sit flat on its four rubber feet and hang on the wall. The four antennas are not only removable but also foldable so that you could optimize them for best signal strength. On the Wi-Fi front, this model has gained one thing but lost the other. Starting with the former, it has the beamforming technique which allows this router to supply uniform signals at all times. However, gone is the MU-MMO so the traffic management might not be as efficient as some of you may like. Apart from its performance, the one thing which attracts users towards this model is its longevity, one that directly stems from this router’s affinity for open-source community. 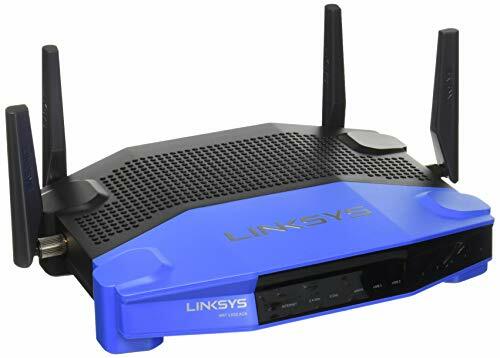 For, if you think that the antennas aren’t working as hoped, you could have them replaced as Linksys have made them detachable. Similarly, if at some point in future Linksys stopped sending firmware updates for this model, you could have them manually install from the market, as this model supports open-source firmware. Lastly, to configure this device, you could download the Smart Wi-Fi app of Linksys from both for both Android and iPhones. This app gives you the option to monitor speed and traffic activity, create a guest network, turn on/off Wi-Fi access and prioritize network traffic via the Quality of Service feature. Pretty basic but useful features, all of them. When a user is spending as much amount as Linksys demands for this model, then he’d be right to expect MU-MIMO technology to accompany the router. Unfortunately, this model won’t provide it. Built like a tank – as its ugly face might testify – it has both the hardware as well as the software to last years. Hence, for those of you who are in the market for a router which could take some beating and still stay strong, the Linksys AC1900 might just suit you.